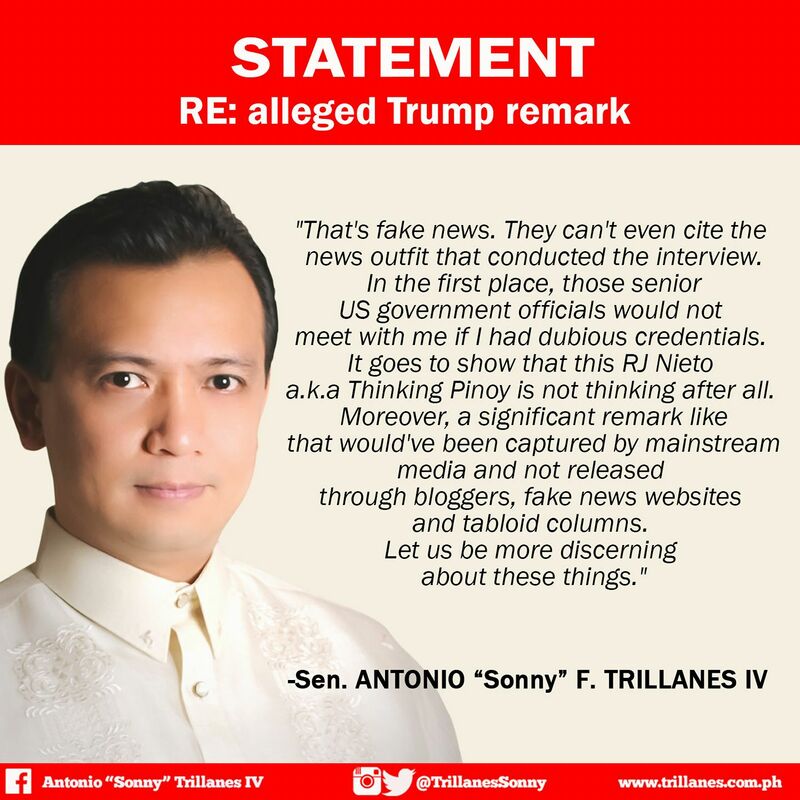 Thinking Pinoy: Trillanes Press Corps refutes Trump’s “narco” comment? Trillanes Press Corps refutes Trump’s “narco” comment? 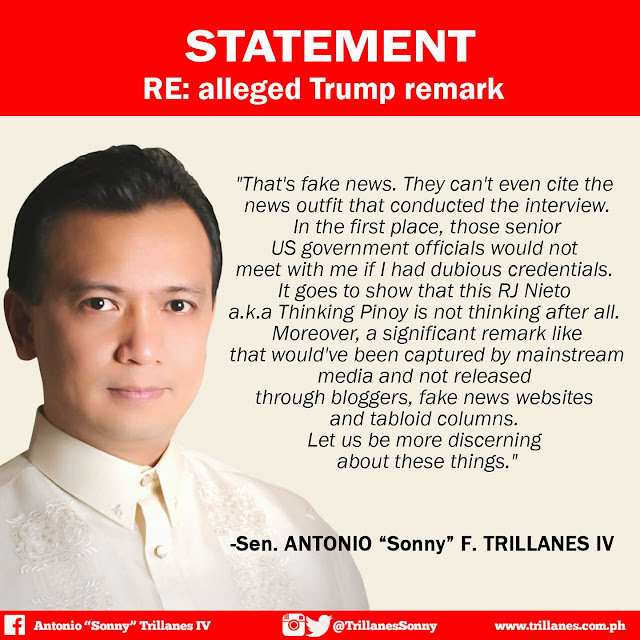 Senator Trillanes attacked my credibility earlier when he refuted reports saying that US President Donald Trump called him a “narco”. Ooohhh, did Trillanes himself tacitly admit that we should doubt mainstream media? TRILLANES, YOU REALLY ARE AN IDIOT. You know, I was hoping that Trillanes statement includes his now-infamous "Gentlepersons." A snapshot of Pedroche's Pilipino Star column published on 30 October 2017. A snapshot of Pedroche's Pilipino Star column (online version) published on 30 October 2017. What is Pilipino Star Ngayon? Pilipino Star Ngayon (PSN) is the leading tabloid newspaper of daily nationwide circulation in the Philippines. It is published in Filipino, and it’s owned and operated by PhilStar Daily, Inc., which also owns and operates the major broadsheet Philippine Star. According to the Philippine Star, PSN is “a wholesome tabloid in Filipino that came to be noted for its commitment to responsible journalism for the mass-based readership”. The paper goes by the slogan "Diyaryong Intelihente ng Masang Intelihente!". Originally known as Ang Pilipino Ngayon, Betty Go-Belmonte thought of coming up with a tabloid that would cater to society segments that aren’t being targeted by national dailies [Philstar]. In 2013 and 2014, Pilipino Star NGAYON was awarded "Newspaper of the Year" by Gawad Tanglaw (Gawad Tagapuring mga Akademisyan ng Aninong Gumagalaw), an award-giving body in the Philippines composed of critics, scholars, historians, and professors from different colleges and universities [Star]. The 2014 Gawad Tanglaw award was received by no less than PSN editor-in-chief Al Pedroche, the same person who wrote that “Little Narco” column piece. 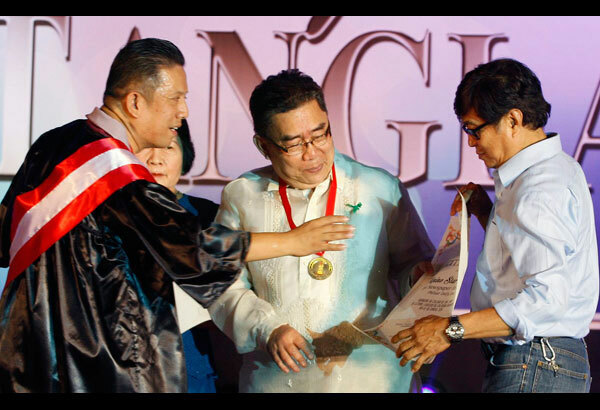 PSN editor-in-chief Al Pedroche and provincial editor Mario Basco receive the trophy, medal, and citation from Gawad Tanglaw President Norman Llaguno at the Colegio de San Juan de Letran in March 2014. Jarius Bondoc, the guy who broke the Roxas Campaign Planes story. By calling PSN a mere tabloid, is Trillanes questioning the credibility of these columnists? 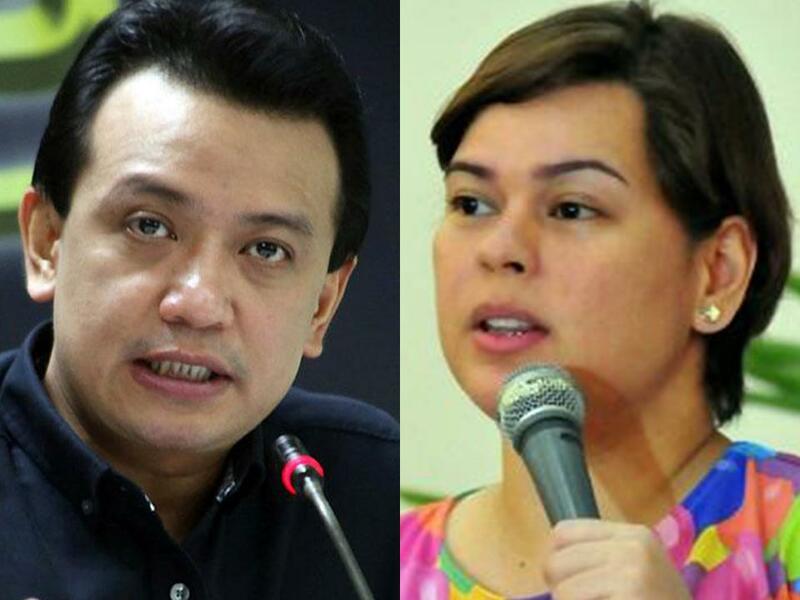 More specifically, is Trillanes questioning the credibility of his own ally, Korina Sanchez-Roxas? Initially, my original post didn’t explicitly cite Pedroche’s column as I felt it’s unnecessary, with Pilipino Star Ngayon being a newspaper of national circulation. Some readers, however, requested for my source, so I tried to retrieve Pedroche’s column and voila! I discovered that the PSN took it down. PSN, however, did not issue a retraction or even an erratum, so it’s safe to conclude that PSN stands by what PSN editor-in-chief Pedroche wrote. Moreover, the mere deletion of its online version does not in any way affect the fact that PSN has published the column on paper. If a news site deletes an article without an accompanying erratum, does that mean it also retracts that article? For one, I highly doubt that PSN has recalled or will recall all the newspapers it printed on October 30th. Hence, Pedroche’s claim still stands. I checked for cached copies of Pedroche’s column, and I archived it. To read the archived cached copy of Pedroche’s column, click here. "That's fake news. They can't even cite the news outfit that conducted the interview. In the first place, those senior US government officials would not meet with me if I had dubious credentials. It goes to show that this RJ Nieto a.k.a Thinking Pinoy is not thinking after all. Moreover, a significant remark like that would've been captured by mainstream media and not released through bloggers, fake news websites and tabloid columns. Let us be more discerning about these things." Pilipino Star Ngayon publishes fake news because it “can’t even cite the news outfit that conducted the interview”. Senior US government officials would not meet with Trillanes if he had dubious credentials. A significant remark would’ve been captured by mainstream media and not through bloggers, fake news websites, and tabloid columns. One thing is clear at this point: ThinkingPinoy published the “narco” comment based on Pedroche’s PSN column. Now, I’m curious as to how PhilStar Daily Inc. will defend Pilipino Star Ngayon’s Al Pedroche. After all, a newspaper that has been given Gawad Tanglaw awards for “Newspaper of the Year” for two consecutive years (2013 and 2014) cannot be considered “fake news”, as that would imply that there’s something anomalous about Gawad Tanglaw. Surely, the “critics, scholars, and academicians” behind Gawad Tanglaw will beg to disagree. Moreover, it’s hypocritical for Trillanes to demand such standards when he himself is guilty of forwarding dubious claims in the very recent past. Take, for example, the “BPI Julia Vargas” issue , where he claimed that then presidential candidate Rodrigo Duterte amassed over a billion pesos in ill-gotten wealth. Asked for his source, he executed an affidavit stating that he got the information from a certain “Joseph de Mesa” who, in turn, got it from an unnamed AMLC official [TP: BangkoSerye]. Mister Trillanes, should I have cited Joseph de Mesa too? Tigilan mo nga ako. “Joseph de Mesa”. Enough said. Partida, hindi ko pa diyan sinama si Matobato. Is Pilipino Star Ngayon, a “Best Filipino Newspaper” awardee, not good enough for you? ThinkingPinoy did not break that news: it was Pilipino Star Ngayon. Hence, the question should be whether Pilipino Star ngayon is part of “mainstream media”. While there is no strict definition of what belongs to mainstream media or not, it must be recalled that Pilipino Star Ngayon’s Ely Saludar was made president of the Malacañang Press Corps, replacing Tony Velasquez of ABS-CBN [Star]. If that’s not mainstream enough for Trillanes, I do not know what else is. 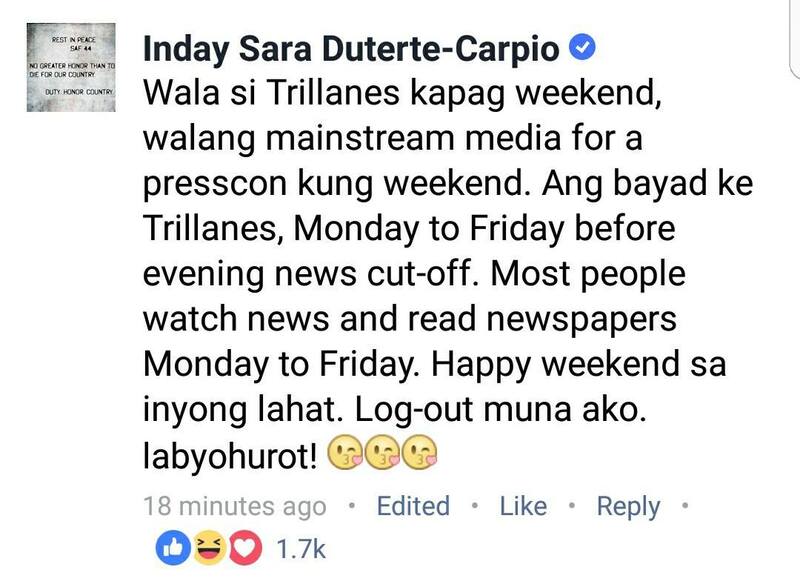 And surely, the tabloid reporters belonging to the Malacañang Press Corps will refute Trillanes’ claim that tabloids publish fake news. So now, Mister Trillanes, is the broadsheet Philippine Star still not mainstream enough for you? Wow! Ang taas ng standards ni Kuya. Wish ko lang e inapply niya ‘yang standards na ‘yan sa sarili niya. But the story doesn’t end here because I noticed something really fishy. This afternoon, [GMA News] and the [Philippine Star] published news articles about Trillanes’ statement-slash-denial, and I saw a very interesting pattern. A reference to Mary Ann Reyes’ 01 November Philippine Star column. Quotes from Trillanes’ denial stament. References to 31 October 2017 Adobo Chronicles’ satirical article about the same issue. References to 31 October 2017 ThinkingPinoy’s “Narco” post. Interestingly, both articles DID NOT mention Pedroche’s 30 October 2017 PSN column, which pre-dated the Adobo Chronicles article. Now, the two reporters could have argued that they didn’t get to read Pedroche’s PSN piece because it was deleted. But surely, neither of the reporters will admit to being stupid, so malice, though not yet a certitude at this point, could have been present. That is, the two reporters seemingly ignored not only the original PSN piece, but also another column piece from another mainstream publication. Did the two reporters commit the same “honest mistake” twice? I don’t know, but any self-respecting beat reporter should read all the major stories in the major dailies before she goes to work. As far as I can see, they either acted with malice, or they’re simply incompetent and lazy. But who would admit to being incompetent and lazy? October 30th: Pilipino Star Ngayon publishes article claiming Trump called Trillanes a “narco”. October 31st : ThinkingPinoy, using PSN as a source, reported that Trump allegedly called Trillanes a "narco”. October 31st: Manila Standard cites the Pilipino Star column piece. October 31st: Adobo Chronicles satirizes the “narco” story. November 1st: Broadsheet Philippine Star picks up the “narco” story. Now, the two news articles did not mention steps 1 and 3, so that their timeline will only include Steps 2, 4, and 5. In short, a possible public relations damage control plan for the Trillanes camp could be inspired by what happened to Manila Times columnist Yen Makabenta last month, where the latter got duped by Fake News about a supposed quote from United States Ambassador to the UN Nikki Haley. First, find a way to get the Pedroche’s PSN column deleted, making it appear that the column piece never existed. Second, make it appear that Adobo Chronicles broke the news, which would basically discredit the story because Adobo Chronicles is widely known to be a satirical news site. Third, with the Adobo satirical article up, discredit any further mention of the “narco” quote by making it appear that whoever will write about it got duped by Adobo. Fourth, to stave off claims that PSN broke the news, discredit PSN by calling it a mere tabloid, without directly naming PSN so Trillanes can avoid incurring the wrath of the Philstar Group. Fifth, focus the attention and blame on ThinkingPinoy. After all, finding mainstream media outlets to join in this attack against ThinkingPinoy will be easy. In short, the strategy revolves around the premise that ThinkingPinoy and Adobo Chronicles broke the story, even if it’s Pilipino Star Ngayon that did and even if the Manila Standard has referred to PSN’s column a day later. If the Little Narco story is fake news, why can't Trillanes confront PHILIPPINE STAR about it? Bakit si ThinkingPinoy ay pinag-iinitan niya, eh Philippine Star ang nag-publish? But there’s one fatal flaw in this possible plan: Trillanes’ initial choice of mainstream allies. Inday Sara Duterte reveals Trillanes Press Corps? Kristine Joy Patag of the Philippine Star. These two reporters wrote the two denial-articles published yesterday. Did the two reporters (Star’s Patag and GMA’s Alvarez) intentionally omit two crucial sources (PSN and Standard) of the “little narco” comment? I checked the list of Philippine Star news articles authored by Kristine Joy Patag and I found out that a vast majority of them are about or are sourced from the Senate, suggesting that Patag is a Senate beat reporter. I also checked the list of GMA News articles and found out the same about Kathrina Charmaine Alvarez, i.e. she appears to be another Senate beat reporter. Yes, Alvarez and Patag appear to be in the Senate Beat, i.e. they are focused mainly on news coming from or about the Senate of the Philippines. It's worthy to note that NO ONE among the senate beat reporters, where Patag and Alvarez belong, reported about Inday Sara's comment, even if it directly concerns them. Well, one thing’s for sure: Patag’s and Alvarez’s respective articles made the evening news cut-off. And did I say that neither of them attempted to contact me for my side of the story? Bam Aquino, ikaw ang makulit sa pagkuha kamo dapat ng both sides, so papaluin mo kaya yung dalawang ungas na yan? It's funny how some mainstream outlets claimed during the #CocoyGate senate hearing that they have internal ombudsmen who check for abuses within their their ranks. However, I have never heard, seen, or read anybody among them getting fired for corruption. Should we start canonizing a number of mainstream journalists? At this rate, yeah, I think we should! Are Kristine Joy Patag of the Philippine Star and Kathrina Charmaine Alvarez of GMA News part of Trillanes’ alleged payroll? I can’t say for sure, and I leave that job to the “internal ombudsmen” of the concerned news outlets, assuming that such “internal ombudsmen” exist. But I am a nice guy, so let me help these theoretically existent “internal ombudsmen” a bit. Who is GMA News’ Kathrina Charmaine Alvarez? GMA’s Kathrina Charmaine Alvarez drew flak last month when she broke the news about Senator Trillanes’ visit to a Singaporean Bank. On 19 September 2017, Alvarez wrote “No such account, Singapore bank tells Trillanes [GMA News]”. 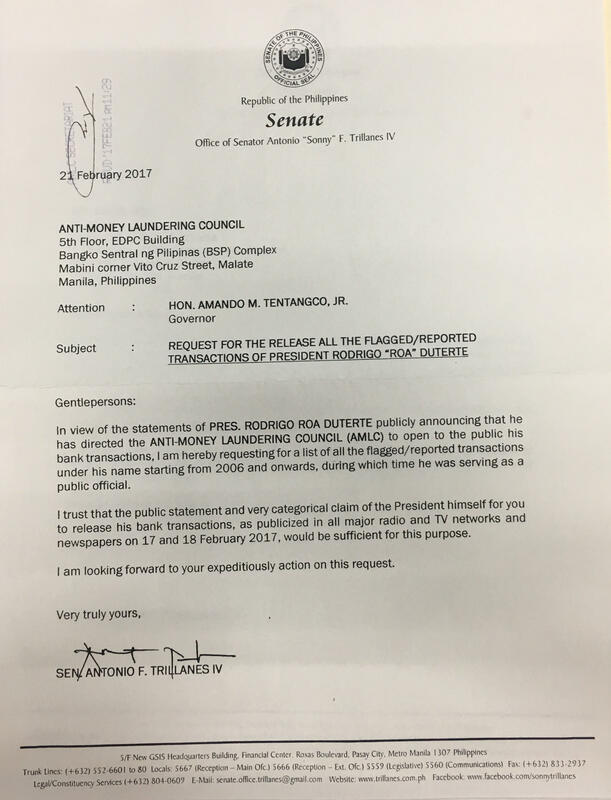 Alvarez’s article was accompanied by a [Twitter video] showing Trillanes entering the Alexandra, Singapore branch of DBS bank. Alvarez did not attribute this video to anyone else, so she must have taken the video herself. That is, unless the Alvarez is based in Singapore, she must have flown to Singapore to cover Trillanes’ trip. From this, we can say that Alvarez was there to witness the event, as this appears to be Alvarez’s direct observation of events as they unfolded. So who paid for Alvarez’s trip to Singapore? The Philippine Star? Antonio Trillanes? Who? Trillanes has his own Press Corps? Kinabog si Duterte?! Taray! Is Alvarez one of the reporters on the Trillanes’ payroll that Inday Sara Duterte alleged? GMA News “Internal Ombudsman”, GO!!! Who is Philippine Star’s Kristine Joy Patag? According to her own LinkedIn account, Kristine Joy Patag graduated with a BA Communication Arts degree from the University of the Philippines in 2010. Straight out of college, she joined the Office of the President of the Philippines as a Presidential Staff Officer II. She was promoted to Presidential Staff Officer III in May 2014, and left the Office of the President when her principal, President Benigno “PNoy” Aquino III stepped down in June 2016. Drafting messages and correspondence for the signature of the President. Drafting action letters, transmittal memorandums, and referrals to other units for the signature of the Head of Office. Researching, verifying, and coordinating with concerned offices accordingly. Editing and proofreading diplomatic correspondences sent to Heads of States for the signature of the President. That is, for the first six years of her work life and using the standards of today’s political oppositon, Patag was officially a government propagandist, similar to the Mikael de Lara Co, whom I wrote about in April 2016 when he lamely defended the Aquino Government for the Kidapawan Carnage [TP: BigasHindiBala], or when the Aquino government shot starving farmers in Mindanao. Going back to topic, where did Patag go right after she left Malacañang? I smell conflict of interest, like that thing about Karen Davila. After leaving the Palace in June 2016, Patag joined Businessworld in August 2016. Businessworld is a sister publication of Pilipino Star Ngayon and the Philippine Star. Judging from her resume, Patag’s career is so far defined by her lengthy stint at the Office of PNoy, so just how much influence does her former Liberal Party allies exert on her today? How would the senior columnist Al Pedroche, who has been a part of Philstar Inc since its inception in the 1980s, react to junior reporter Kristine Patag’s seemingly willful snobbing of his article?